Kanada ist ein Paradies für Naturliebhaber und Outdoorbegeisterte. Diese Abenteuerreise durch Kanadas Nationalparks bietet dir intensive Naturerlebnisse. 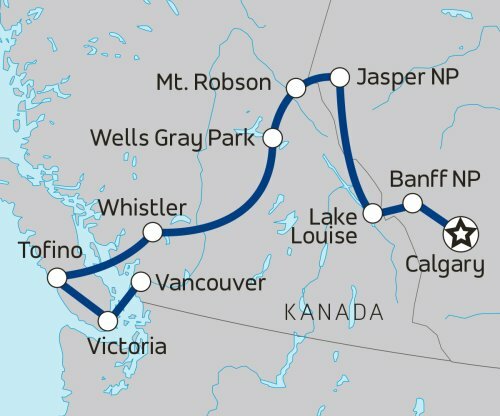 Die Nationalparks Jasper, Banff und Yoho locken mit atemberaubenden Landschaften, einer reichen Tierwelt und zahlreichen Möglichkeiten aktiv zu werden. Lass dich begeistern von der spektakulären Bergwelt der kanadischen Rocky Mountains, wandere in grandioser Natur und haltet auf einem Bootsausflug auf Vancouver Island die Augen offen nach Walen und anderen Meerestieren. Der Icefields Parkway, eine der landschaftlich schönsten Panoramastraßen überhaupt, die eindrucksvolle Eislandschaft des Columbia Icefield, das Wanderparadies Lake Louise und eine Kanutour im Wells Gray Provincial Park werden dich ebenso begeistern wie Whistler mit seinen zahlreichen Freizeitmöglichkeiten, Victoria mit seinem britischen Flair und die wunderschöne Metropole Vancouver, wo Natur und Stadt miteinander verschmelzen. Die Unterbringung erfolgt in Doppelzimmern bzw. 2-Personen-Zelten. Alleinreisende werden zusammen mit Mitreisenden gleichen Geschlechts untergebracht. Gegen Aufpreis ist auch die Unterbringung im Einzelzimmer/-zelt möglich. Bei dieser Reise übernachten wir für eine Nacht im Hotel, aber die meisten Nächte werden in Zelten auf öffentlichen und privaten Campingplätzen verbracht. Die Hotels sind gut gelegen, bieten eine gute Qualität (2-3*) und die Zimmer verfügen über private Badezimmer. Die komplette Campingausrüstung wird zur Verfügung gestellt (außer Schlafsack und Kissen) inklusive komfortabler Matratzen (selbstaufblasbar). Die Kuppelzelte sind von guter Qualität und lassen sich leicht in wenigen Minuten aufbauen. Die Zelte sind mit 2 separaten Reissverschlusstüren ausgestattet, so dass jeder Teilnehmer seinen/ihren eigenen Eingang hat. 1. Private Campingplätze: Diese sind privat geführt und verfügen in der Regel über umfangreiche Ausstattung wie Feuerstelle, Picknick-Tisch, Trinkwasser, Toilette und Dusche. Einige haben kleine Swimmingpools und Wäscheservice. Diese Campingplätze befinden sich in der Nähe von Nationalpark-Eingängen oder von Städten. 2. Öffentliche Campingplätze: Diese Camps werden von den Parkverwaltungen geführt und verfügen über die grundlegenden Einrichtungen wie Feuerstelle, Picknick-Tisch, und Trinkwasser. In einigen Fällen müssen diese Arten von Campingplätzen keine Duschen, nur Plumpsklos und einen See! An anderen Orten können sich WC und Dusche außerhalb des Campingplatzes befinden oder manchmal auch ein Stück Fahrt entfernt. Einige der öffentlichen Campingplätzen bieten Duschen gegen Gebühr an (US$ 2-6). Plane zusätzlich 155-205 USD für nicht inbegriffene Mahlzeiten ein. Arrive at any time. The adventure begins tonight with our Welcome Meeting. Feel free to explore, but make sure you're back in time to meet the group. After introductions, your tour guide will review the details of your tour. You've arrived! Why not share a meal and a drink with your new travel mates? 65CAD per person. Calgary hosted the 1988 Winter Olympics, meaning you can still ride in a four-man bobsleigh reaching speeds of 120kph (85 mph) here. Luge down the track on a wheeled cart or soar across the zipline. Hike up the well marked trail for a central view of the town of Banff and the surrounding mountains. 42CAD per person. Take a gondola to the famous Sulphur Mountain and enjoy the spectacular view of the whole mountain range and the village below. Johnston Canyon is certainly an area that shows the power of nature and time; rushing water carves a path through the limestone canyon and potholes form over the years from plunging waterfalls. 18-36CAD per person. Rent a canoe and leisurely enjoy the scenery from a calm section of the Bow River. Free. This busy trail traverses over mostly barren land. You will be rewarded with incredible views of the Saskatchewan Glacier and the ravine below. 10-30CAD per person. Rent a bicycle to see a bit more of Banff. Be sure to be on the lookout for elk and deer on the trails. This historic trail follows the shores of Lake Louise, eventually pushing out into a scenic assembly of peaks and glaciers. Stop and enjoy a cup of tea at the cozy, remote Plain of Six Glaciers Tea House. Originally built in 1901 by the Canadian Pacific Railway, the Lake Agnes Tea House has been serving fine loose-leaf teas to visitors for over one hundred years. Hike along a forested trail as you make your way past Mirror Lake and cascading waterfalls, to the shores of Lake Agnes. This lovely log building serves up a great cup (over 100 loose-leaf teas!) as well as finger food. 110-135CAD per person. Raft on one of the most famous rivers in Canada. The Kicking Horse River is the ultimate whitewater rafting destination in the Rocky Mountains and is guaranteed to provide the thrill of a lifetime. 40CAD per person. Visitors are given the opportunity, as part of a one-of-a-kind interpretive tour, to watch a grizzly bear interacting much as it would in the wild: foraging, hunting, playing, swimming, and, of course, snoozing. Visit one of the most iconic hotels in Canada. This beautiful hotel was rebuilt after a fire in 1924 and stands looking out at the breathtaking Lake Louise and the Victoria Glacier. Get ready for an awesome sight: Takkakaw Falls is one of the highest waterfalls in Canada, with a free fall of 254m (833 ft)! Discover the beautiful wilderness setting of Emerald Lake and its surroundings, popular for sightseeing, canoeing, and hiking. Skirt around the lake and enjoy the incredible scenery. Make the stunning drive to Jasper via the Icefield Parkway. Visit beautiful Peyto Lake, and stop at Columbia Icefield Centre before arriving in Jasper in the evening. To travel the icefield parkway is to experience one of Canada's national treasures and most rewarding destinations. Stretching 230 km between Lake Louise and the town of Jasper, the parkway offers easy access to one of the most spectacular mountain landscapes on Earth. This is a wonderful journey through the heart of the Canadian Rockies, a vast wilderness of magnificent peaks, pristine mountain lakes, and broad sweeping valleys. Stop at Columbia Icefield for an unforgettable experience. Continue on to Jasper. In the evening, set up your camp and enjoy a nice warm campfire. 100CAD per person. At the Columbia Icefields, enjoy a glacier walk with an expert guide on the lower Athabasca Glacier to explore and understand the life of this active glacier. Walking on this glacially carved landscape is an experience you won’t soon forget. 80CAD per person. Travel onto the glacier in an oversized ice rover. Get out and experience the stunning alpine glacial vistas at the mid-point of your journey. This astonishingly blue lake will truly take your breath away. View one of the Rockies' largest and most accessible active glaciers. The Athabasca Glacier recedes at a rate of nearly 5m (16.4 ft) a year. See this natural beauty while you still can. Stroll through Maligne Canyon and explore the surrounding area of Jasper. In the afternoon, head back to check out the lively mountain town where the afternoon is yours to do what you like. 65CAD per person. Glide across the beautiful blue waters of Maligne Lake, the Canadian Rockies' largest glacial fed lake, on your way to the famous Spirit Island. 65-110CAD per person. Pass through many small sets of rapids and calm stretches, which allow your National Park Licensed guide to point out the natural and human history of Jasper. The Athabasca River is the same route that was used by the fur traders many years ago. Free. The Bald Hills hike has a fairly steep incline. 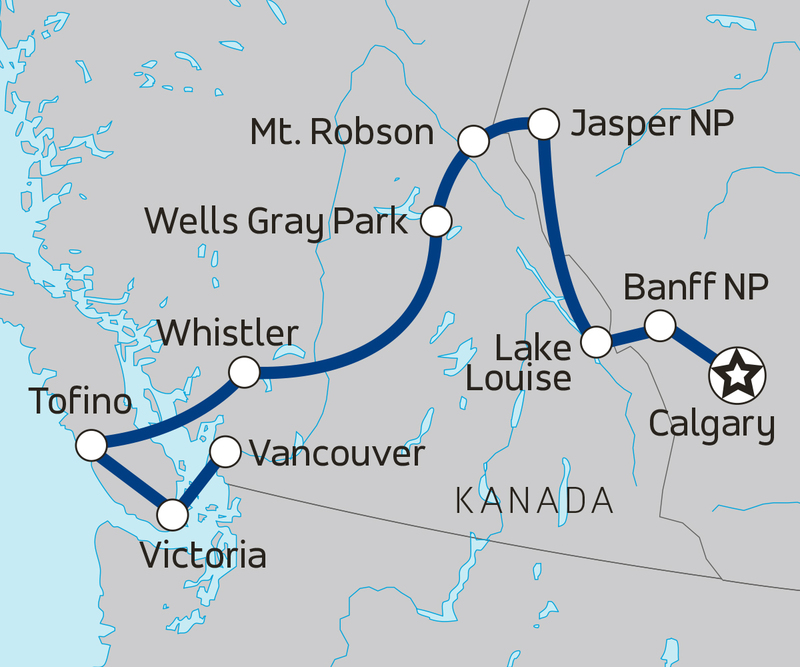 The 10km (6.2 mi) round trip will showcase the best panoramas of Maligne Lake and numerous mountains surrounding the lake. 30-90CAD per person. Rent a canoe from the longstanding Boathouse on Maligne Lake. Malinge Canyon follows an interpretive trail with several bridges. Hover over the Malinge River that, over thousands of years, has eroded the canyon to over 60m (197 ft) in some spots. Visit an impressive waterfall in Wells Gray Park. Spahats is the First Nations term for bear, which has is the name of the stream that flows to the falls. Stop at the visitor centre and, if it’s a clear day, see the top of the Mount Robson, the tallest peak in the Canadian Rockies. Head out for an exciting day of canoeing in the Canadian wilderness. Stop at some of the most beautiful waterfalls in the park, including the world famous Helmcken Falls. Get in a boat and start paddling! Enjoy a day of canoeing on beautiful Clearwater Lake with local guide and an included shore lunch. Enjoy a visit to this wide waterfall that spans the Murtle River. In spring and early summer, thousands of litres of water rush over the falls every second -- it's a spectacular sight. Set in a lush canyon, the world famous Helmcken Falls is the most iconic in the "Waterfall Park" - it's three times the height of Niagara Falls! Enjoy the spray and beautiful scenery on your visit here. Drive through dense woods into the Canadian desert and finally to the beautiful coastal mountains. Our drive from Clearwater to Whistler takes around 10 hours and includes a lunch stop in Marble Canyon Provincial Park. The clear waters of Turquoise Lake in Marble Canyon PP make it an ideal spot to stop for a swim in the summer. Wake up in one of Canada's greatest natural playgrounds. Go for a hike in the morning, then enjoy a free afternoon to relax or explore more of Whistler and its surroundings. You can opt out of today's hike if you'd prefer to spend the whole day exploring other parts of Whistler. Hike one of the many beautiful trails in the Whistler area. The scenery here is stunning. Head to Shannon Falls or the Stawamus Chief and enjoy the sight of the waterfall. Opt to Hike to Brandywine Falls for incredible views of Daisy Lake, the mountains, and of course the waterfall. Or set off for Chekamus Lake for an easier route. Ask your tour guide to point you in the right direction. 150CAD per person. Get your adrenalin fix on on this exhilarating white water rafting trip. Enjoy the amazing scenery along the way, and keep your eyes peeled for bears. 129CAD per person. Spend the day in the sky, floating through Whistler's rainforest on one of Canada's longest ziplines. 53CAD per person. Soak up the scenery with 360-degree views of mountains, lakes, and glaciers. Hop out at the top and take a short hike or grab a coffee and snack at the mountaintop restaurant. Catch a glass bottom gondola to get an even better view. 18CAD per person. Take a trip back to a time of ancient traditions, and learn about the history and culture of two First Nations groups who have called this region home for centuries. Try playing drums, making traditional crafts, and listen to stories from members of the Squamish and Lil'wat communities for an authentic First Nations experience. Take a ferry across to Vancouver Island. Stroll the trails beneath ancient Douglas firs in MacMillan Provincial Park. Arrive in time for a gorgeous sunset. In the morning, drive a short distance to Vancouver. Taking a ferry to Nanaimo on Vancouver Island is an exciting part of the adventure of getting here. BC Ferries offers an outstanding service that travels through some of the most beautiful scenery in the world. In the afternoon, continue to drive to Tofino, just in time for sunset. Come by this beloved Vancouver Island attraction near Parksville to grab a meal, explore the market, and watch the goats on the roof - yes, really! Enjoy a visit to beautiful MacMillan Provincial Park. Cathedral Grove, located in the park, is one of the most accessible stands of giant Douglas fir trees on Vancouver Island. Stroll through a network of trails under the shadow of towering ancient Douglas fir trees, majestic pillars untouched by the modern world, some more than 800 years old. Search for orca whales in the morning on a Zodiac tour. In the afternoon, enjoy free time and take in Tofino's unique blend of fisher-meets-surfer vibe. Your excursions take you through the pristine waters of Clayoquot Sound, revealing sensational scenery and wildlife, such as gray whales, sea lions, seals, porpoise and killer whales (orcas). Travel south down Vancouver Island to British Columbia's capital, Victoria. Take a stroll around the city and take in the West Coast vibe. 32CAD per person. Visit this famous National Historic Site of Canada. The Butchart Gardens are absolutely stunning floral show gardens. 16-26CAD per person. Filled with local human and natural British Columbian history, the BC Royal Museum always has a unique cultural and artistic exhibit on showcase. Come by this beloved Vancouver Island attraction near Parksville to grab a meal, explore the market, and watch the goats on the roof -- yes, really! Take a ferry back onto the mainland. Trip ends upon arrival to Vancouver. Opt to spend the afternoon exploring this beautiful, easy-going city. In unseren Gruppen triffst du die unterschiedlichsten Menschen, und genau das macht sie so interessant. Aber eins haben alle unsere Reisenden gemeinsam: sie möchten eine großartige Reise erleben, eine einzigartige Zeit zusammen mit Gleichgesinnten Travellern verbringen und mit ganz viel Spass & Freiheit die Welt entdecken. Unsere Gruppen sind im Durchschnitt mit 10 Personen unterwegs und sind eine bunte Mischung aus Einzelreisenden, Freunden und Paaren jeden Alters aus der ganzen Welt. Du wirst in deiner Gruppe die unterschiedlichsten Persönlichkeiten kennenlernen und auf deiner Reise jede Menge neue Freunde finden. Mit Menschen aus verschiedenen Ländern werden alle unserer Erlebnisreisen auf Englisch durchgeführt. Oberflächlich betrachtet, geht es beim Camping darum, unter freiem Himmel zu schlafen und dein Essen über einem offenen Feuer zu kochen. Aber wenn du einmal Campen warst, weißt du, dass es in Wirklichkeit um die Gemeinschaft geht. Camping bringt Fremde auf eine Art und Weise zusammen, wie es keine andere Reiseart kann. Und wenn alle miteinander aushelfen, bleiben die Kosten niedrig und die Stimmung hoch. Denk daran: Es gibt kein "ich" im "Team". Mitmach-Camping bedeutet, dass die Reisenden für sich und andere sorgen. Die Aufgaben - Ein- und Auspacken, das Fahrzeug sauber halten, beim Kochen helfen usw. - werden täglich zugeteilt und wechseln innerhalb der Gruppe durch. Typischerweise wirst du nach der Ankunft erst mal dein Zelt aufstellen und dann entweder beim Kochen helfen oder danach aufräumen. An einigen Abenden unterwegs genießt du auch Abendessen in Restaurants und Übernachtungen in günstig gelegenen Hotels. Um sicherzustellen, dass du deinen Schönheitsschlaf bekommst - und um gleichzeitig die Kosten zu minimieren - teilst du dein Zweibettzimmer im Hotel mit anderen gleichgesinnten Reisenden. Damit du richtig nahe an der Natur bist, beinhalten die meisten Touren Übernachtungen auf öffentlichen Campingplätzen. Wir verwenden 2-Mann-Zelte mit gepolsterten Luftmatratzen, und die ganze Ausrüstung (außer Schlafsack und Kissen) ist im Preis deines Trips inbegriffen. Unsere großen Zelte sind in ungefähr fünf Minuten aufgebaut, und die meisten Campingplätze verfügen über Toiletten, fließendes Wasser und einfache Duschen. Einige Campingplätze haben sogar weitere Einrichtungen wie Geschäfte, WLAN-Zugang und Wäschereien. Dein Reiseleiter übernimmt das Einkaufen und die Essensplanung (außer du möchtest unbedingt dein Lieblingsessen von daheim kochen, dann melde dich einfach), aber die Reisenden helfen bei der Essenszubereitung mit. Wir führen eine Menge Vorräte mit, darunter Frischeprodukte und Frischfleisch, um sicherzustellen, dass unsere Mahlzeiten immer gesund und herzhaft sind. Lokale Genüsse sind ein essenzieller Teil aller amerikanischen Road Trips, und du wirst Gelegenheit haben, alles Mögliche auszuprobieren - Jambalaya, Hummer, Texmex, Poutine, und vieles mehr - wenn wir nicht am Campingplatz essen. Zum Frühstück gibt es großzügige Buffets; zum Mittagessen Sandwiches, Salate und ab und zu ein Barbecue; zum Abendessen dreigängige Menüs. Wenn wir campen, musst du keine Essensbeiträge zahlen, und in den Städten hast du die Flexibilität, zu essen, wo du magst. Was, wenn ich alleine unterwegs bin? Weil es manchmal einfach praktischer und komfortabler ist, dein eigenes Zimmer (oder Zelt) zu haben, bieten wir allein Reisenden die optionale Möglichkeit gegen Aufpreis ein eigenes Zelt bzw. Zimmer zu buchen - ein Mehr an Privatsphäre zu einem Spitzenpreis. Ansonsten teilst du Zimmer und Zelt mit Mitbewohnern gleichen Geschlechts, damit alle Kosten sparen können. Bitte berücksichtige beim Organisieren deiner Transportmittel (z. B. Flüge) die unten angegebenen Zeiten, zu denen du deine Gruppe frühestens treffen bzw. spätestens verlassen kannst. Dabei haben wir die Zeit für die Reise vom/zum Flughafen an deinem Reiseziel sowie für Check-in bzw. Gepäckabholung/ Einreiseformalitäten mit einbezogen. Spätestmögliche Ankunftszeit deines Fluges: Ankunft zu jeder Zeit möglich. Frühestmögliche Abflugzeit: 21:00 an Tag 14.